I like to imagine that at some point someone has asked about my Venn Diagrams: where does she come up with this crap?!?! Well, the Magical Venn Unicorn is a real thing. I didn't make it up yesterday in a fit of delirium. It lives under my desk, feasting on the scraps of my lunches and anything else it can scavenge in my office. 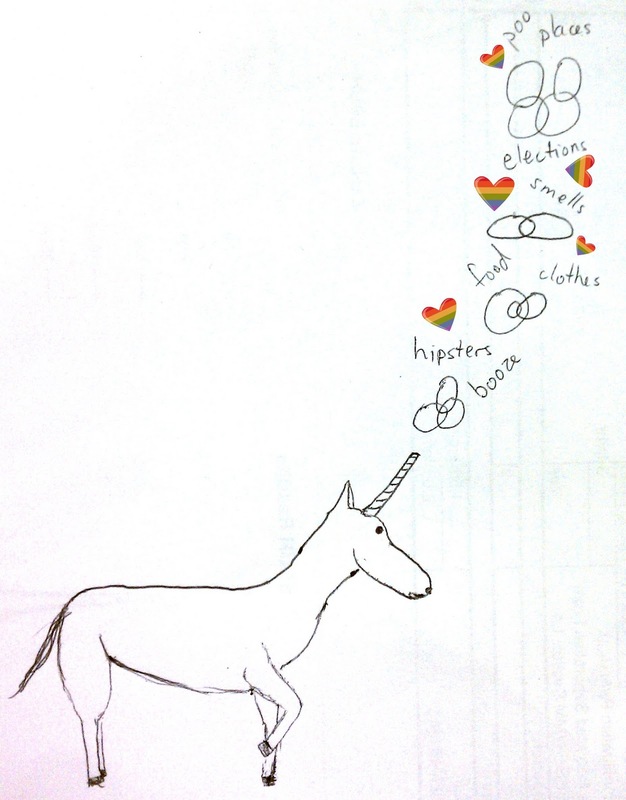 Yesterday, I managed to draw up a quick picture of the Magical Venn Unicorn in action. It spews out random words and circles, and then those eventually coalesce on my screen. It also spews out gay rainbow hearts1. Q: Isn't it cruel to keep such a beautiful creature under your desk? A: It stays because of its own free will2. Q: Why are its proportions so weird? A: First of all, that's rude. 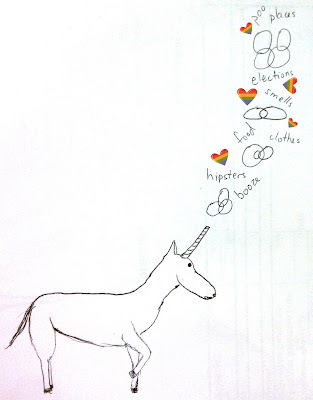 Secondly, the well-proportioned unicorns don't get stuck with the crap powers like Venn Diagramming. Q: Aren't you afraid Voldemort is going to come drink its blood? A: No. Voldemort is a fictional character. Q: Have you considered using its power for evil? A: Yesterday I had a Venn Diagram teaching you how to swear. So, obviously yes. Q: Can I give one to my favorite child/niece/nephew/grandchild/whatevs? A: Yes you can! Just hit print, then BAM you have a great paper toy! I will not be held responsible for the gayifying effect it might have or for any paper cuts. Q: Where can I find more super awesome unicorns? 2And because of the fence I've put up.